Built in 1905, Colonial Penn Center building's gables, fenestrated arcade of arched windows, and castle-like front door give it an air of the medieval. It has served as LDI's headquarters since 1967. *From South Street : Travel three blocks to 33rd Street. Turn right onto 33rd Street. Travel one block to Walnut Street. Turn left onto Walnut Street and travel four blocks to 37th Street. LDI is one block off of Walnut Street on Locust Walk (a pedestrian street), between 36th and 37th Streets in the Colonial Penn Center (CPC) building. 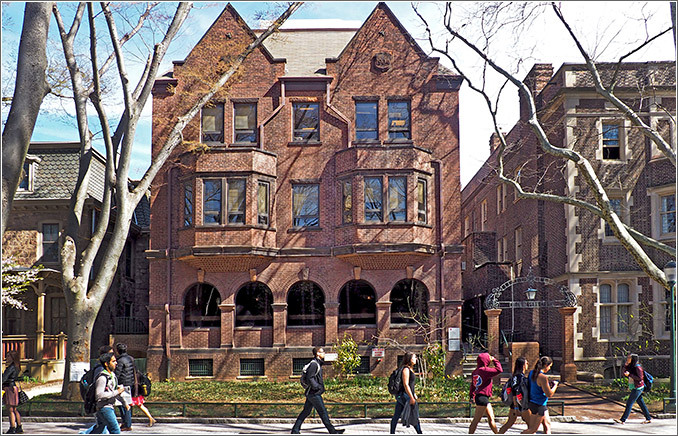 CPC is across Locust Walk from Wharton's Steinberg-Dietrich Hall, and next door to Penn's Women's Center. The closest parking facility is on Walnut St. between 37th & 38th sts. There is metered parking along both sides of Walnut Street. Note that you cannot park on the left side of Walnut Street between 4-6 PM. We are near SEPTA's University City Station (R1, R2, and R3) and Amtrak 30th Street Station. From University City Station: We are a 10 minute walk from the University City Station. Exit at South Street. Turn left onto South Street (becomes Spruce Street), and travel six blocks to 37th Street. Turn right onto 37th street. Travel one block to Locust Walk. Turn right onto Locust Walk. The Colonial Penn Center is the second building on your left. Market-Frankford Line "El" to 34th and Market.